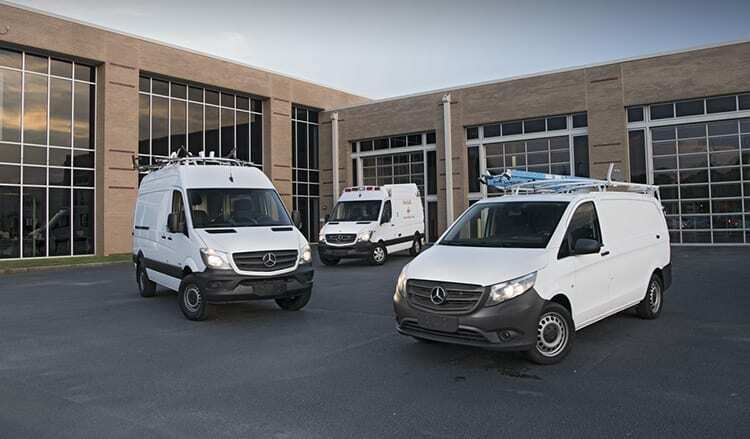 Turn on the TV during any U.S. football game lately and you are likely to see an advertisement for the 2017 Mercedes-Benz Metris van. What gives? Isn’t Mercedes-Benz a luxury car marker only? Not at all. Here are 5 things you need to know. Here is in the U.S., consumers have seemingly lost the appetite for vans, yet commercially and worldwide, the demand is extremely high. As it turns out, people buy a lot of vans globally and Mercedes-Benz is the largest van producers out there. Also, it is worth noting you will likely hear more about Mercedes-Benz as time goes by. Last year, they announced plans for a $500 Million Sprinter plant in South Carolina. The Sprinter van is the larger brother of the Metris. It maybe smaller than the Sprinter, but it doesn’t make many other concessions. The 2017 model has tons of cargo room and is essentially a mid-size truck with a camper shell (yet, more functional). 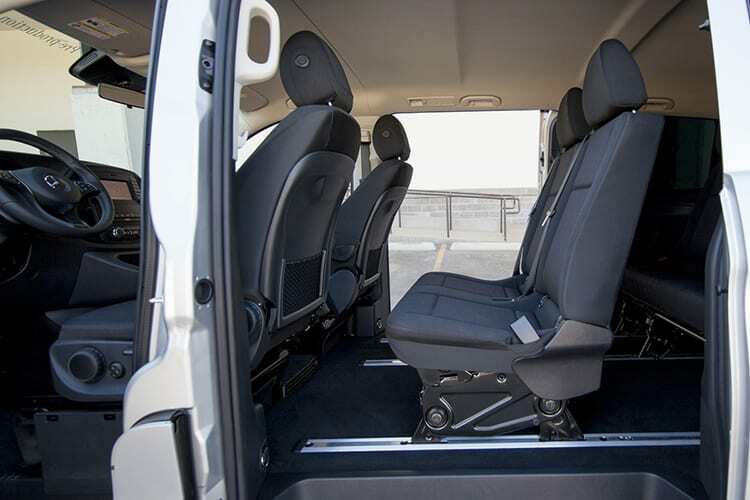 Our test model included three rows of seats and could comfortably hold 7 people – real American-sized people and not kids. These seats were removable and we could stack drywall inside the van. 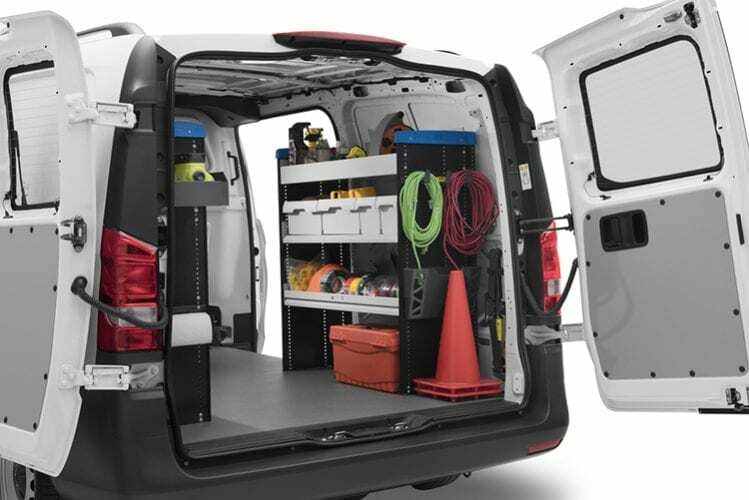 The van isn’t tall enough to really stand in, but with sliding doors on both sides and the rear doors opening out of the way, it is easy to access all parts of the rear cargo area. The truth is I’m a big fan of commercial vans for a variety of what may seem like dumb reasons. First, I love how easy they are to enter/exit especially compared to cars and some trucks. The door opens wide and it doesn’t feel like heavy and big like a 1970s Continental door when it is fully open. Entry is simple and made easier with a low step in height. Perfect! And not just for adults, children could very easily enter and exit the cabin. In fact, with the basic interior, this van might just be a better family hauler than other consumer vans especially if you have messy kids. 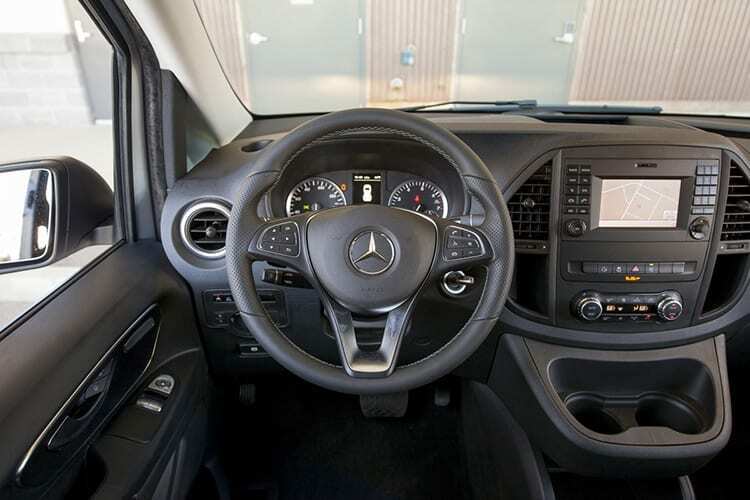 Inside the cabin, the seating position puts you up and seemingly over the front end giving you unlimited visibility for driving and parking. The controls are basic and straightforward and the seats are pretty comfortable. All in all, it is a good driving experience albeit a commercial one. Without a doubt this isn’t your typical Mercedes-Benz product like an AMG performance coupe. The cabin isn’t filled with luxury materials nor does the powertrain make quick work of a 1/4 mile. Instead, this is a commercial van and it is quite good. Powering our test model was the 2.0L turbocharged four cylinder producing 208 HP. This is mated to a 7-speed automatic and comes in rear-wheel drive. Frankly, this plenty for the light-weight van and even loaded down we would suspect it has plenty of power. Note it is still a van, so no spirited cornering maneuvers. The compact commercial van market is an interesting place with many fleets preferring one brand to another based really on repair ability. Pricing does play an important factor as well, but being able to fix it is a big priority as well – although long-term warranties are diminishing this need. 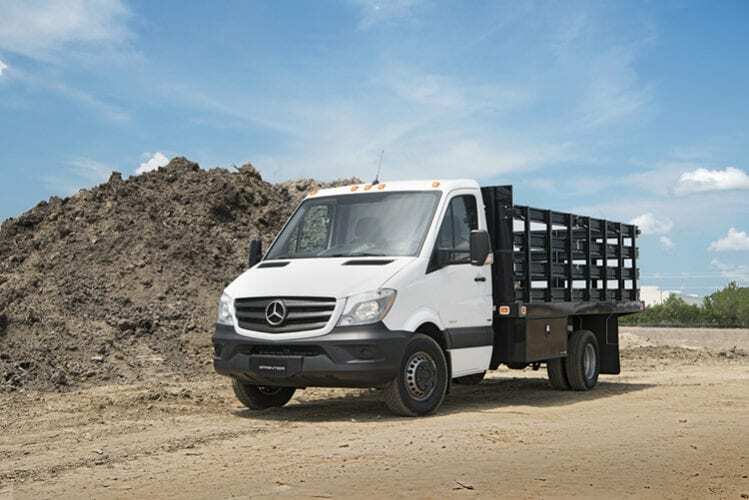 For the 2017 Mercedes-Benz Metris its $26,990-33,895 price range puts it about $2k or more above its competitors like the Ford Transit Connect, Ram ProMaster City, Chevrolet City Express and Nissan NV200. However, this price difference is based on the base MSRP and often fleet sales come with discounts to offset this difference. In the end, the 2017 Mercedes-Benz Metris is a great work tool and a pretty good family hauler. With new home construction on the rise lately, we will likely be seeing a lot more of the Metris whether on the TV or in person and after a week behind the wheel, it is clear why. It is a pretty darn good work van.